While Moylan’s had a sports-bar feel, Lagunitas was something else entirely. Picture the fictional taproom at the brewery you’ve been designing in your head for years…that’s what Lagunitas looks like. Petaluma itself (at least where the brewery is located) wasn’t particularly attractive…and the drive up to the brewery has an industrial, office-park feel to it. But things change immediately once you walk through the gorgeous wrought-iron gates with the tell-tale Lagunitas dog-logo tacked to the top. An outdoor, zen beer-garden opens up before you with pea-gravel walkways, tree-lined borders, and picnic tables sprinkled throughout. A covered bar is connected to the garden with one wall essentially open to the outdoor space where a local band pumps out some relaxed tunes under the shining California sun. Fusion IV: None of us were crazy about the Fusion IV…an odd strong ale/wild ale hybrid that was a little too heavy on the farmhouse funk and horse blanket. The pungent, musty aroma and limited carbonation turned me off a little and the body was oddly lacking in malt sweetness. It was an interesting beer and perfect in a flight sample glass, but I would have been woefully disappointed if I had ordered a full pint. Just a strange beer all around. 2 Hops. Cappuccino Stout: Very flavorful, very rich beer with a big burst of roasted espresso beans and nice chocolate aromas. The chocolate and coffee drown out the malt and hops a little too much and I thought the body was a touch thin, but despite its lack of balance, it’s a nicely drinkable Imperial Stout with good complexity and tons of interesting notes. 3 Hops. Little Sumpin’ Wild: One of Lagunitas’ best brews, the Little Sumpin’ Wild is a Belgian Strong Pale Ale that truly does justice to the style. Beautiful Belgian yeast notes make their presence felt immediately in the nose, and there’s a great citric, West Coast hop profile balancing everything out. It smells like a Duvel with a liberal helping of good ol’ American hops sprinkled in. If that sounds good to you…well…it is. Supremely drinkable and refreshing with the classic, smooth mouthfeel that sets Lagunitas apart, the Little Sumpin’ Wild is a rock-solid brew that I would drink every day if I could. 4 Hops. Sadly, our time in Petaluma was short, but at least we had Russian River to look forward to. 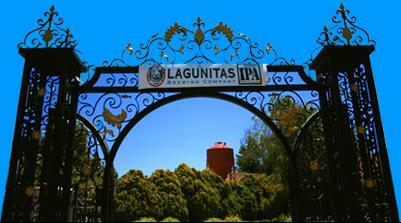 During my next trek to Northern California, I’ll be making a much more extended stay to Lagunitas…a brewery that should be on every Aleheads short list of “must-visit” ale factories. Posted in Ale Factories.Tagged Belgian Strong Pale Ale, Cappuccino Stout, Fusion IV, Hairy Eyeball, Imperial Stout, Lagunitas, Little Sumpin' Wild, Strong Ale. Nice assessment of Little Sumpin’ Wild, Barley – it was terrific from the bomber; must have been truly magnificent on draught.